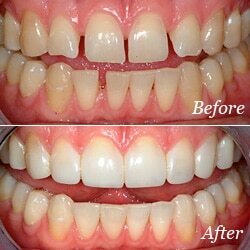 There was a time when there were few options apart from extraction for damaged or discolored teeth. However, thanks to restorative dentistry procedures, there may be options that allow us to save a damaged tooth rather than extract it. Dental bonding involves applying a resin material over a damaged tooth to restore it. The procedure can also be used to improve your smile. The resin material looks like just like your natural teeth and hence does not stand apart. If you have one or more of these issues then dental bonding may be the right option for you. It’s a painless procedure that can typically be completed in a single sitting. The process is very simple. A white filling is carefully placed on the damaged tooth to improve the look. Bonding is usually painless, however, anesthesia may be used in case of a decayed tooth that first has to be drilled. The next step involves roughening and conditioning the tooth so that the bonding material can adhere to the tooth without any issue. The resin is then applied in the desired shape and is hardened with the help of a laser. Our dentist will polish and sharpen the resin to make sure it looks good and causes you no trouble. The process usually takes about 40 minutes. What Are the Side Effects of Dental Bonding? Almost everyone can be a candidate for tooth bonding as it’s a risk-free process. While it’s supposed to last for about ten years, bonding can often break and cause pain. However, a simple visit to the dentist can help solve this problem. What is the Cost of Dental Bonding in Richardson? The cost depends on the severity of the case. We offer affordable dental bonding in Texas. Call us today to get a quote. Why Should I Choose Bobby Jivnani for Dental Bonding? We are among the most well-known dental practices in Richardson. Our dentists are experienced and will answer all your queries regarding dental bonding and other dental procedures performed at Bobby Jivnani. Call us to get an appointment to start your journey towards a healthy smile and perfect set of teeth.